I notice that writers do it all the time. Sometimes it will be song lyrics, or a quote by a famous person. I also do it all the time. Other people have such interesting things to say. A few years ago, after finding a website that featured the last words and criminal reports of death row inmates, I wrote a series of poems about executions in Texas. In some of the poems I quoted the inmate’s last words. What a tricky business. While writing I asked myself some questions. Should I edit the inmates last words? Did my poems exploit the inmates? Was this a form of plagiarism? More recently I’ve used other real words such as a saying from my mother, a report on bird attacks, and lines from a book on geography. These are the tips that I would give to someone who wants to use someone else’s words in a poem. My biggest decision when using another person’s words is whether or not they need to be verbatim, or if I can chop and change them to suit the poem. For instance, I felt comfortable changing the location and season of an online report of a bird attacks. Who would care? With the death row poems, it was a little different. It felt unethical to change the inmate’s last words—spoken at possibly one of the most vulnerable moments of their life—for the sake of sound or rhythm. So before writing, decide where that line is for you. For instance, in my death row poem Dennis Dowthitt, I tabbed Dowthitt’s words into three columns so they stand out as being different from the rest of the poem (and also make them sound a little crazy). As his last words are in the first person, I wrote the rest of the poem in the third person so a reader could tell where my voice ended and his began. Sarah Jane Barnett’s first collection of poems, A Man Runs into a Woman, was launched by Hue & Cry Press in August 2012. You can find out more about it on the Hue & Cry Press website. 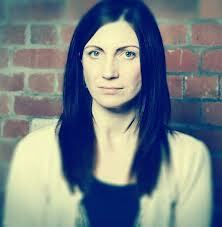 Sarah has a Masters from the IIML, and is currently completing a PhD at Massey University in the field of ecopoetics. You can listen to some of the current MA students from the IIML Writing for the Page workshops read next Monday, September 10th at Te Papa, to get a preview of the latest crop of emerging talent. Full WOM programme details here.